Apolice car is pretty high on the list of things you don’t want to crash into. And unfortunately for one Tesla driver, his vehicle did just that. 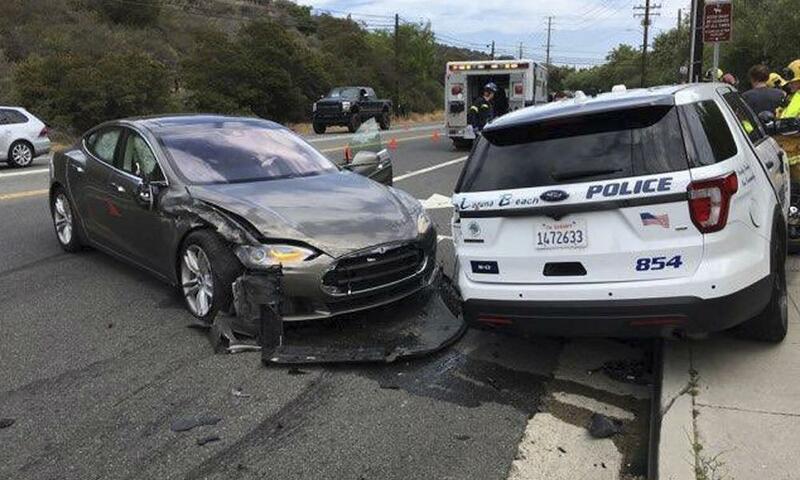 The Tesla Model S, which was in Autopilot mode, reportedly veered into a parked police cruiser in Laguna Beach, California on Tuesday. While the crash “severely” damaged both vehicles, the Tesla driver suffered “minor injuries,” USA Today reported. The driver, a 65-year-old Laguna Niguel man, told police that he had engaged Autopilot mode prior to the crash. The police cruiser, on the other hand, was unoccupied — the officer was standing about 100 feet away responding to a call. Interestingly, police Sgt. Jim Cota told USA Today that the Tesla Model S crashed in “almost the same place” as another Tesla running in Autopilot mode about a year ago. In response to this crash and similar incidents, Tesla maintains that Autopilot is not designed to avoid collisions and drivers should not rely on it entirely, the Associated Press reported. “When using Autopilot, drivers are continuously reminded of their responsibility to keep their hands on the wheel and maintain control of the vehicle at all times,” Tesla said in a statement. The crash comes in the midst of increasing public scrutiny about autonomous vehicles in general — and Tesla’s Autopilot mode in particular. Earlier this year, an Apple engineer was killed when his Tesla crashed into a freeway barrier while in Autopilot mode. And in May 2016, a Tesla Model S owner was killed when his vehicle failed to recognize and collided with a tractor trailer. Similarly, Uber, another pioneer of the tech, suspended its autonomous vehicle testing after one of its self-driving cars hit and killed a pedestrian in Arizona. Just last week, Tesla settled a class action lawsuit which claimed that Autopilot was “essentially unusable and demonstrably dangerous.” The settlement involved dropping any usage of the word “dangerous,” Reuters reported. While self-driving cars are largely expected to make roadways safer, it will likely take time to inspire consumer trust in the technology. A recent study carried out by AAA found that 73 percent of people polled in April did not trust autonomous vehicles, up from 63 percent in a similar poll last year.